November- it's kind of an in between month around here. Wildacres has closed as of today. The crazy of October is over, Holidays are still far away enough to be ignored. It's one of my busiest times in the studio as I get ready for the tour, but there's very few entries on the calendar so far. Good time for a contest right? I've had this blog for over two years, I'm pretty impressed with that. It's been lots of fun, and through my blog writing and reading I've met some pretty neat people. But it's a strange feeling not really knowing who's out there reading. 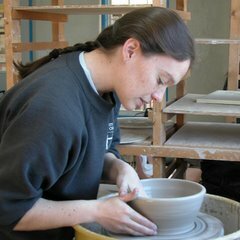 There are about 6 people that I know are regulars but I have no idea who's just here occasionally, or who pops in just when I send out a newsletter to my pottery mailing list. Hence the contest. Leave a comment to any post written in the month of November and I'll put your name in the hat for one of my mugs, your choice of color. If you don't get a response to your comments, it's because you are set to no-reply and blogger won't give up your email address. I'd love to be able to reply to every one! This looks like it will be fun for you to get to know more of your readers. Enjoy the adventure! Hey Sarah. I have your blog bookmarked and check in on it every once in a while. I love seeing your cute little boy growing and changing, and your artistic talent continues to amaze someone like me who has none! Maybe I'll make it up for the Studio Tour this year. hi sarah, i am pretty sure you know i read. i haved loved watching the boy grow and it is nest to see a little one so different than mine (read, mellow, not crazy). sorry, i am a no reply person..i think. well you know (?) me through my Sarah...and I stop by to see news of Ceilo and drink from your mugs when we're in Grass Valley (our country getaway. Happy blogiversary! Your boy sure is cute ! !